The Real Living HER Open House List for New Years Day 2012. There are two open houses on the Real Living HER Open House List! .... However neither open house is "open" on January 1, 2012, New Years Day, both open houses are January 8, 2012. A new listing in Lewis Center, joins a listing in Hilliard on the Real Living HER Open House List. After the first of the year there should be more open houses on the open house list. LOOKING for the Real Living HER Open House List? DiscoverColumbusOH.com is Columbus Ohio real estate information. The site focuses on the Columbus, Dublin, Hilliard, Olentangy, Westerville and Worthington school districts, in particular but you will find info on Gahanna, Grandview Heights, Plain Local, Upper Arlington as well as others. SDelawareCoHomes.com is about real estate in the Big Walnut, Buckeye Valley and Olentangy School Districts in particular but also the areas where Franklin County and Delaware County overlap. WorthingtonOldandNews.com focuses on the Worthington City School District including areas in the City of Worthington, City of Columbus and unincorporated areas. The links in the sideabar work... above are "just an image these My Links do not work..." The links in the sidebars do. 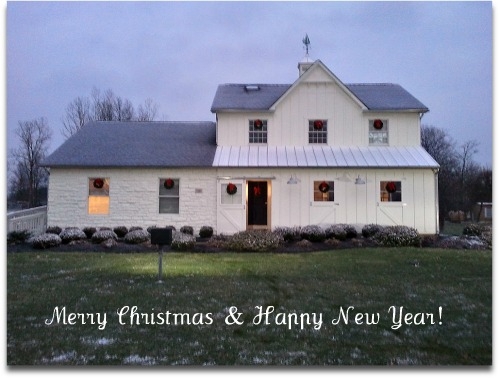 Open each Saturday and Sunday* 1 to 5 PM New England Homes - 5191 Columbus Pike, Lewis Center, OH 43035 (Route 23, just north of Shanahan Road.) The New England Homes sales center is not a model home, stop by for information about the "People's Choice" in central Ohio. *Ooops New England Homes is not open this Sunday or last Saturday and Sunday either but weekend hours at "the Barn" continue in 2012, starting Saturday January 7, 2012. New England Homes builds throughout central Ohio. Looking for a list if open houses on Columbus Ohio real estate on ActiveRain, a real estate network? 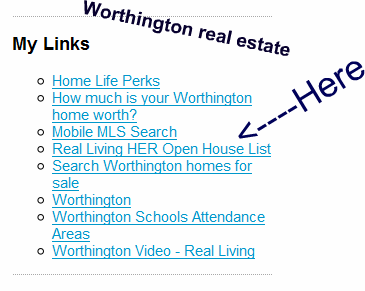 There is a link to the Real Living HER Open House List there in the right sidebar! Looking at this Real Living HER Open House List info on Localism.com ? You are out of luck, no sidebar there to edit. Looking at this info on another site that syndicated or borrowed the information? You are out of luck.... or just click on a link above to see Columbus Ohio real estate, Worthington Ohio real estate or s. Delaware County, Ohio real estate.